Finding a fish oil that is rich in omegas is a great way to support a healthy pregnancy. While there are many “purified” fish oils on the shelf today, choosing one that is naturally pure like wild Alaskan salmon oil is ideal for mother and baby. Wild salmon oil, an excellent source of whole-food DHA, is important for fetal development of the brain and retina during pregnancy and through the first year of life. Emerging research also suggests that other omega fats, including whole food EPA and AA, play an important role in delivering this critical DHA to the fetus and inpromoting a healthy pregnancy. 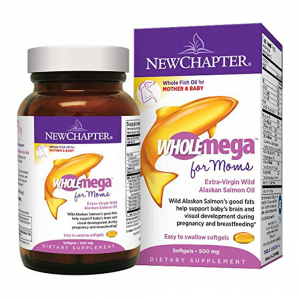 New Chapter® is proud to offer a whole-food approach to fish oil and an alternative to the fractionated, high-heat processed and “purified” oils on the market today. From the pristine, protected waters of Alaska directly to you, Wholemega Prenatal is 100% wild-caught salmon oil; rigorously tested to ensure each capsule delivers Nature’s bioavailable, effective, and whole basket of vital fatty acids and beneficial nutrients. The dull, yellow hue and watery texture of conventional fish oil capsules is symbolic of “purified” products. This heavy distillation (which can be necessary to remove contaminants) can fractionate, isolate, and destroy beneficial compounds that give fish oil its naturally vibrant color and clarity. Wholemega Prenatal, however, delivers an oil that is striking in color and transparency. The brilliant hue in Wholemega Prenatal comes from Astaxanthin – an extremely powerful antioxidant that is naturally found in wild salmon and abundant in this extra virgin fish oil. The gentle process used to extract Wholemega Prenatal preserves this antioxidant as well as numerous other beneficial compounds – including Vitamin D. In fact, this whole oil is delivered from a government inspected FOOD GRADE facility. Wholemega Prenatal is a true expression of nature’s wisdom. By using only sustainably caught Alaskan salmon – among the world’s cleanest and most pure fish stocks in the world – chemical processing to deliver purity is not required. Our extra virgin, low-heat process is all that’s needed to deliver Nature’s whole basket of vital Omega fatty acids and naturally beneficial nutrients, like Vitamin D and Astaxanthin. As a FOOD GRADE oil, Wholemega Prenatal is extensively tested for detectable contaminants that other fish oil products must “purify” or distill out. 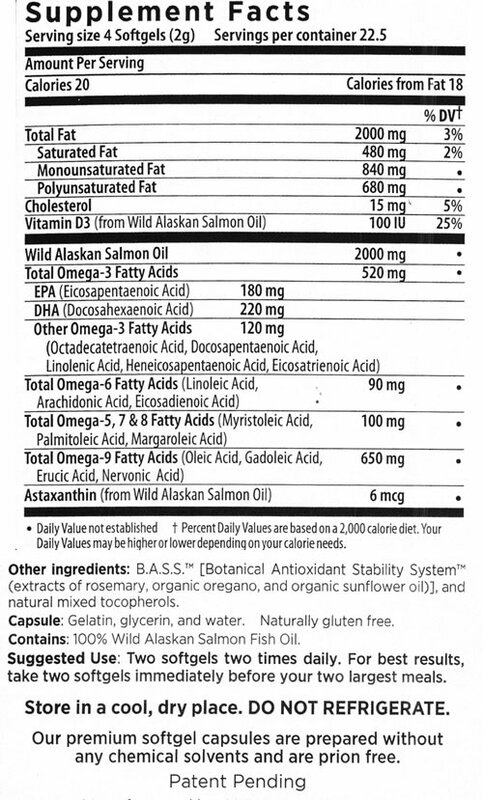 For optimal benefit, fish oil must be incorporated into cell membranes, where it serves to modulate cell signal events (e.g. modulate inflammation) and increases membrane fluidity. * As demonstrated in a human clinical trial, Wholemega Prenatal has been shown to incorporate into peripheral blood mononuclear cells (PBMCs) – allowing fish oil to provide its beneficial effects. Suggested Use: Two softgels two times daily. For best results, take two softgels immediately before your two largest meals.